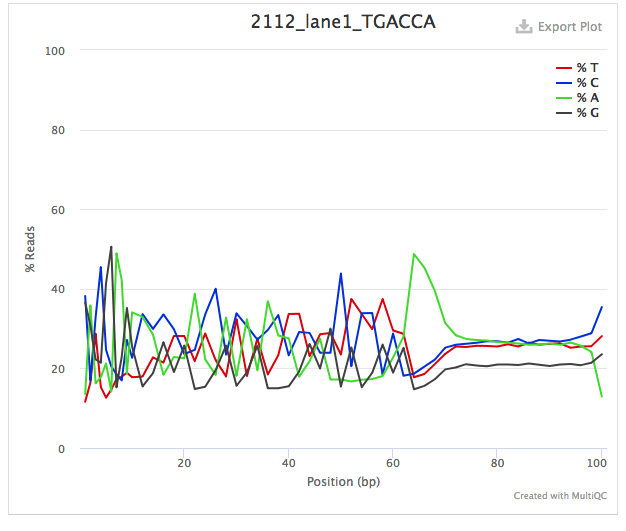 I say process them with TrimGalore!, using default settings and see how they turn out (should get rid of a LOT of adapter sequence; I think that's why we see that small peak in the Sequence Duplication Levels plot). I suspect that'll help a bit, but we'll have to try to figure out if/why FastQC doesn't like them. I'll go ahead and get them trimmed. (the graphs not the heat maps). TGACCA should likely be dropped. And, now that I've looked at things further, don't want to trim last 26bp.